CCBoot client application has option that allows you to enable USB write protection for you client PC, preventing any user form unauthorized copy of data from your client computers. 1. Boot your client in "Super client" mode, and then open CCBoot client application. 2. On the "CCBootClient" window, click the "Addition option" button. 3. 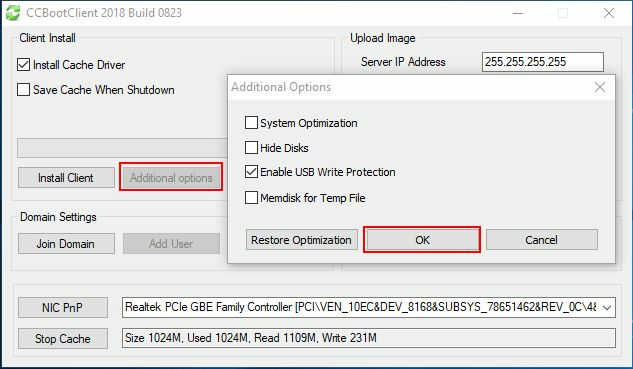 Then on the "Additional Option" window, check the "Enable USB write protection" check box and click "OK" button (Figure 1). 4. Restart the client computer and check if you can write on your USB. 5. Once confirmed, turn off the client PC and save the image.